The N54 is a direct injection twin-turbocharged straight-6 automobile engine from BMW. It debuted at the 2006 Geneva Motor Show and was launched in late 2006 as a high-performance option for the BMW 3-Series, first to be released along with the new 3-series E92 Coupé, to be followed closely by other existing 3-series models, then with other BMW series as well. The N54 has won five straight International Engine of the Year awards, and three straight Ward's 10 Best Engines awards. The N54B30 does not use the second generation Valvetronic technology found in the naturally aspirated N52 and the newer (single) twin-scroll turbocharged straight-6 N55. The engine block of the N54 is derived from the older generation BMW M54B30 engine - all aluminum with cast iron cylinder liners. This is because the newer N52 aluminum-magnesium engine block was not deemed as suitable for turbo-charging with the above-mentioned engineering goals. The N54's block size is identical to the older M54B30 at 2979 cc/181 in³ instead of the 2996 cc/182 in³ of the new N52B303.0L engine, while the N54 is physically heavier (195 kg (430 lb)) than the very light (161 kg (355 lb)) N52 engine. There are some differences between the M54 and N54; the M54 is a single-piece block, with the water pump housing cast into the block, and is a closed-deck design, compared to the N54's two-piece block with a separate bedplate, electric water pump, and open deck. According to BMW, the N54B30 produces 306 hp (228 kW) and 400 Nm (295 lbft). Third party testing has revealed the engine is significantly underrated, producing 332 hp (248 kW) and 422 Nm (311 lbft) in one test. BMW has rated this engine at 225 kW and 400 Nm. However, independent testing has revealed the engine is significantly underrated, producing 332 hp (248 kW) and 422 Nm (311 lbft) in one test. A variant of the N54B30 with higher power and torque but across a narrower peak torque band is used in the 2009 740i and 2011 335is. The most powerful version of the N54 is found in the 1 Series M Coupe. 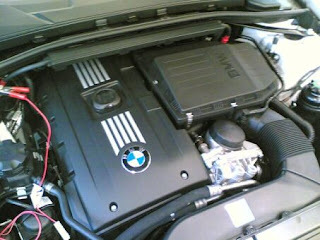 The N54 has considerably higher horsepower and torque, compared to BMW's recent straight-6 engines which were all naturally aspirated such as the high output versions of the N52B30 (which has the same displacement as the N54), with the N54 having an additional 45 horsepower and 80 pound-feet of torque over the N52B30. The N54 is the upgrade engine in the 3 Series and 5 Series, above the N52 naturally-aspirated base powerplant. BMW's newer N55 3.0L turbo inline-6 uses a single turbocharger but with twin scroll technology, and its 300 lb-ft of torque comes at 1200 rpm which is 200 revs earlier than the N54’s identical output. The N55 is also more fuel-efficient and has less emissions than the N54. However, the N54 engine has more output potential and a variant of the N54B30 with higher power and torque but across a narrower peak torque band is used in the F01 2009 BMW 740i. A comparison test saw the 2011 BMW 740i accelerate quicker than the 2011 BMW 535i (equipped with the N55), even though the 535i weighs 300 pounds less. It was not until 2012 (for the 2013 model year) that a high-output version of the N55 engine debuted which will replace the last variants of the N54. The torque characteristic of the N54 engine combined with the relative lack of turbo lag provides a similar feel to a small V8, according to a journalist. The advantage of the N54B30 engine is that compared to similar power output 225 kW (302 hp) 290 lbft (390 Nm) V8 4.0L N62B40 it weighs 70 kg less than the V8, which is massive at 265 kg (584 lb). Additionally, the N54 has higher low-end torque than the N62B40. In the 5 Series (E60), the N54 in the 2008 BMW 535i gives it almost equivalent acceleration to the BMW 550i, with a V8 engine (4.8L N62B48) which costs an additional $10,000 USD in MSRP and makes the front 200 pounds heavier (which affects vehicle handling). In the 2011 BMW 740i, the N54 is down 85 hp (63 kW) and 120 lb·ft (160 N·m) compared to the BMW 750i’s N63 4.4L twin-turbo V8, however the 740i weighs about 215 pounds (98 kg) less, which considerably improves handling dynamics. The 740i also retains respectable straight-line acceleration in a comparison test as it could make the 0 to 60 mph (97 km/h) run in 5.1 seconds compared to the 750i's 5.2, and the 750i only catches up at 70 mph (110 km/h), with the N54 having less turbo lag, smoother acceleration, and smoother power delivery than the N63. Fuel economy of the 740i is 17 mpg city and 25 highway, compared with the 750i’s 15/22 and the ActiveHybrid 7's 17/26, considering that the 740i has an MSRP of $71,025 USD while the ActiveHybrid 7 (which shares the N63 V8 with the 750i but mated to an electric motor) starts at $103,125 USD. In at least the US market, the N54 engine has been characterized by a very large number of High Pressure Fuel Pump (HPFP) failures. On 26 October 2010, following an ABC News story about HPFP failures, BMW announced a recall of vehicles with the pump in question from manufacturing years 2007-2010. A class action suit has been filed against BMW regarding these problems. Last updated on 10 July 2013 at 14:19.